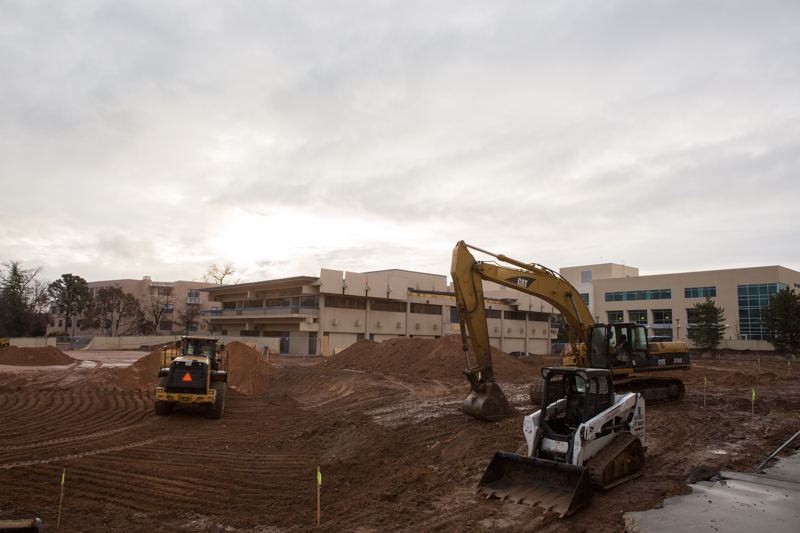 The work on the McKinnon Center for Management is on time and on budget. The substantial completion date is March 15, 2018. 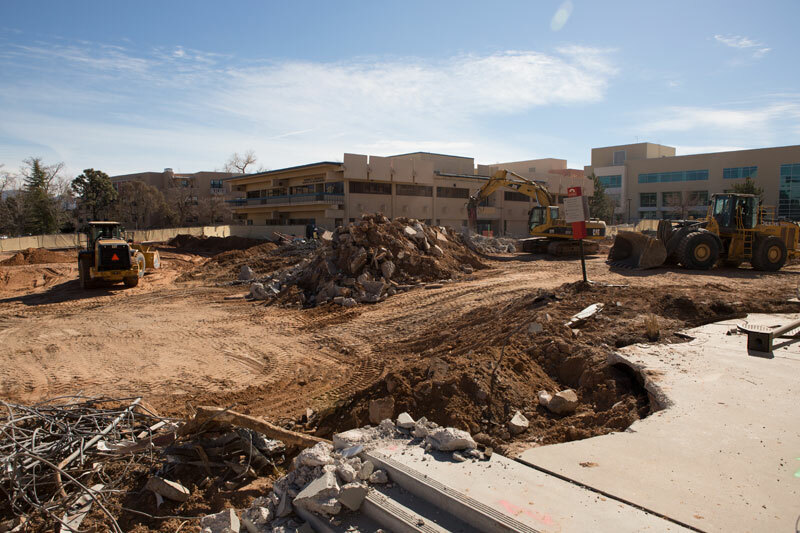 From mid-April to mid-May furniture and classroom technologies will be installed. The new elevator for ASM East is operational but not available for use until January 26. This is due to the need to install a steel beam to reinforce a wall adjacent to the elevator. 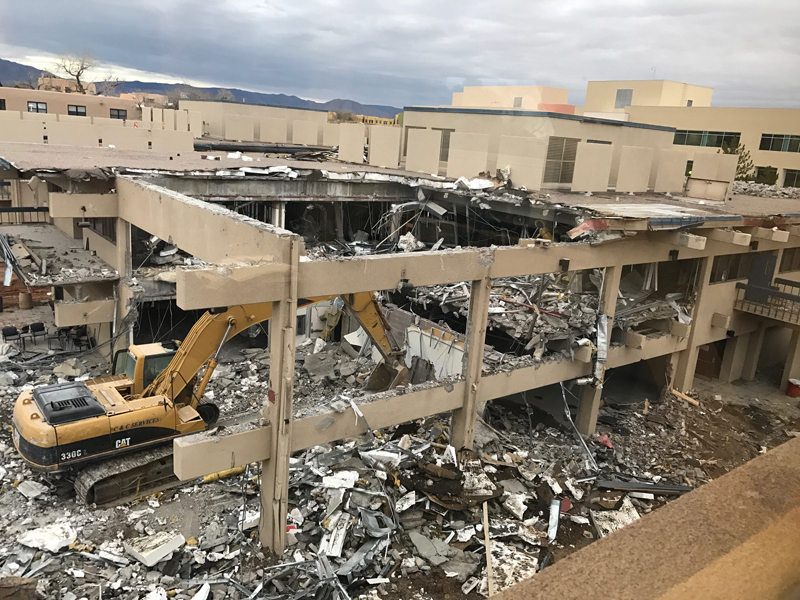 ASM East will undergo a major transformation on the ground floor beginning fall 2018 at the earliest. More information about this will be announced at a later date. Documentation and photos courtesy of Dr. Steven Yourstone. The following picture was taken looking east in the living room. A very airy and comfortable environment. The seating will consist of tables, chairs, sofas, floor lamps, and carpeting. The ceiling will have fabric baffles to aid in the acoustic qualities of the living room. The carpeting is to be installed in the sunken levels in the floor. Flooring is highly polished concrete with carpeting in classrooms, conference rooms, and offices. The building has all LED lighting. 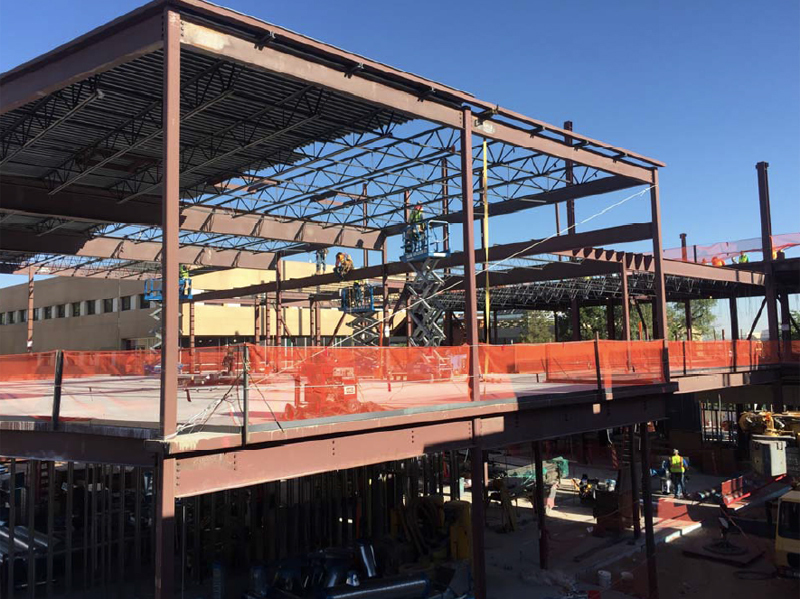 The best forecast from our Architectural and Construction team for The Mckinnon Center for Management is substantial completion on March 15, 2018. Following that there will be a punch list of items to be done. That is common for new structures. 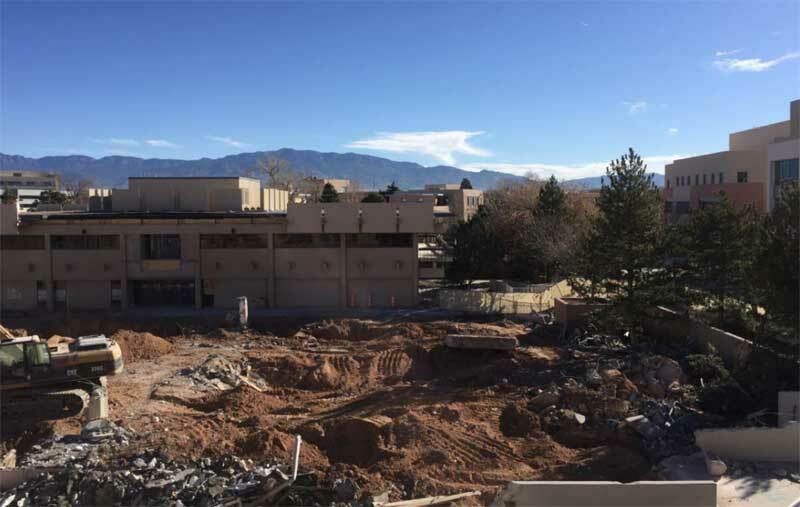 For about a month following March 15, 2018 the building will go through testing, system balancing, and certifications. Beginning today McCarthy Brothers is preparing ASM 2102 (formerly Dr. Vora's office) for conversion to an elevator lobby. The base board heater in ASM 2104 (Dr. Bose's office) is being disconnected from the same unit in ASM 2102. The first floor immediately inside of the left doors of Advising will be converted into both the elevator lobby and a small storage room. 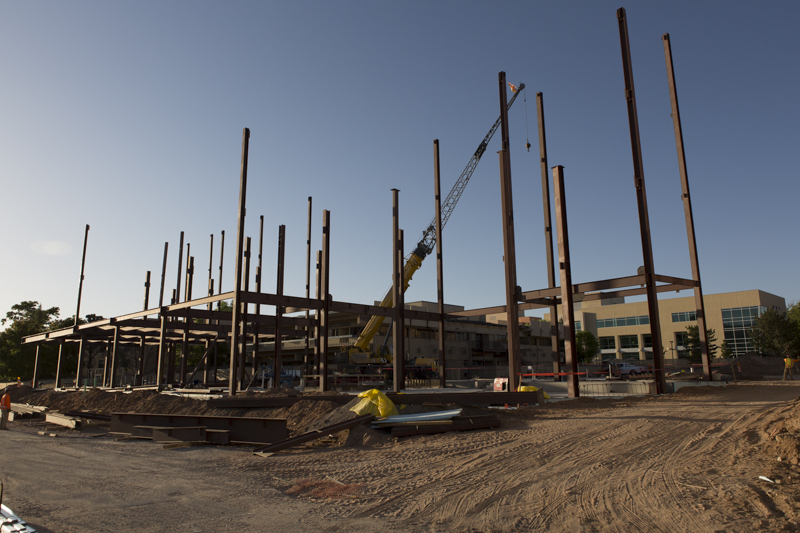 A landmark has been reached in the construction of the McKinnon Center for Management. 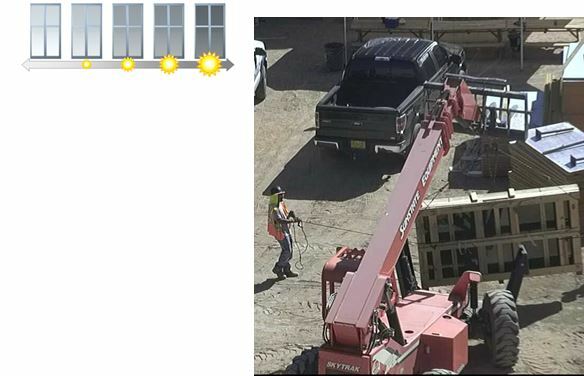 The first three windows arrived on Friday, September 15, 2017. These are not ordinary windows. All windows are high efficiency. Moreover, the windows on the east, south and west elevations will be thermo chromic windows. These windows will darken relative to the amount of sun shining on them. 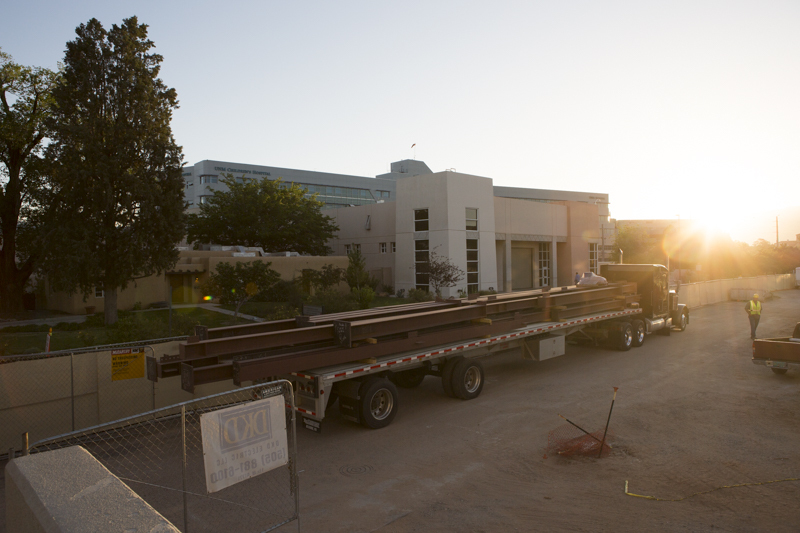 These first arrivals will be installed in the two-story area of the building containing four of our five new classrooms. 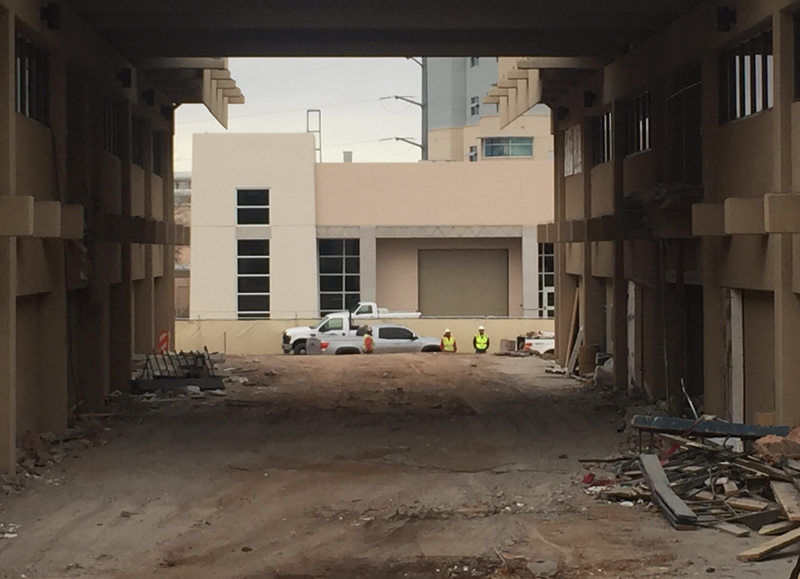 The project is on schedule for substantial completion on March 15, 2018. 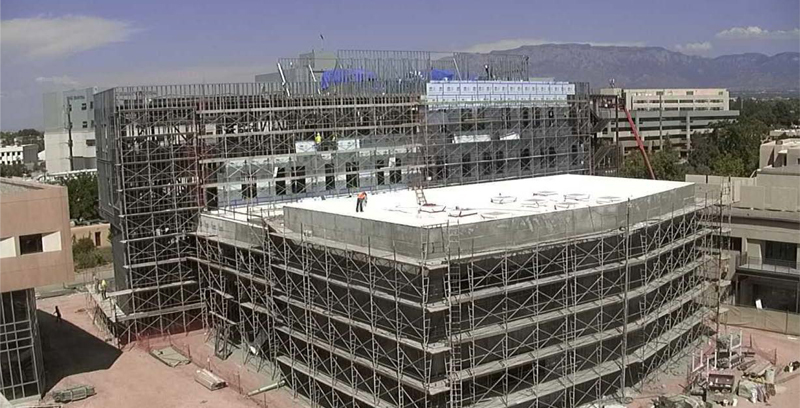 Skylights installed on the fourth floor roof. Glazing for area "B" (the two story south portion). The window installations will begin this week. Elevator delivery Friday September 15. 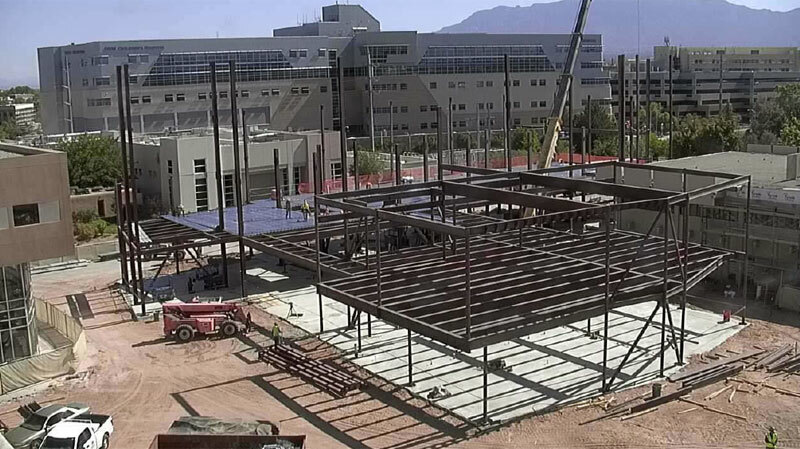 You will see in the picture below a metal structure going up above the fourth floor. That structure is the penthouse that will house mechanical equipment. On the roof of the two-story building area "B" are nine skylights. The tops of the skylights can been seen in the picture below. The classrooms on the second floor will benefit from those skylights. Each one of the nine skylights will have a motorized shade. Skylight size and placement was modeled by EDI -- our LEEDs consulting firm. The project is on schedule for substantial completion on March 15, 2018. After that, the furniture needs to be installed. In addition, we will need all classroom devices installed. We do not yet have a date for faculty and staff to move into offices. On July 26, 2017 there was a beam signing ceremony. It is a tradition to paint a beam white, attach a small tree, and attach the American flag. Ian and Sonnet McKinnon were the first to sign followed by some of their family members. You can see in the photo below the sticker "as." That represents All State Steel. All of our steel is fabricated just south of Albuquerque. Today (July 31, 2017) metal mesh is being installed on top of the metal decking. 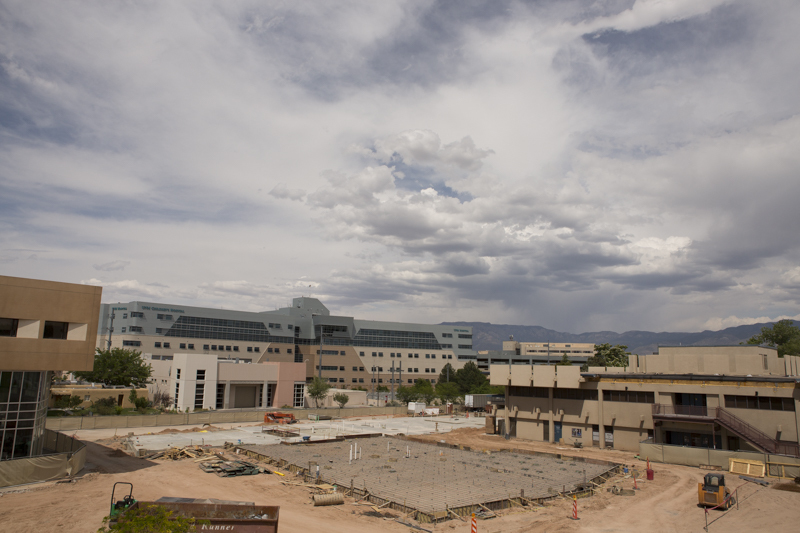 Wednesday concrete will be poured, smoothed, and water cured for seven days. Water curing is done by hosing down the new concrete and then covering it with plastic tarps. The water is replenished as needed. This is intended to reduce the incidence of cracking. The concrete plant also adjusted the mixture by adding more fly ash. 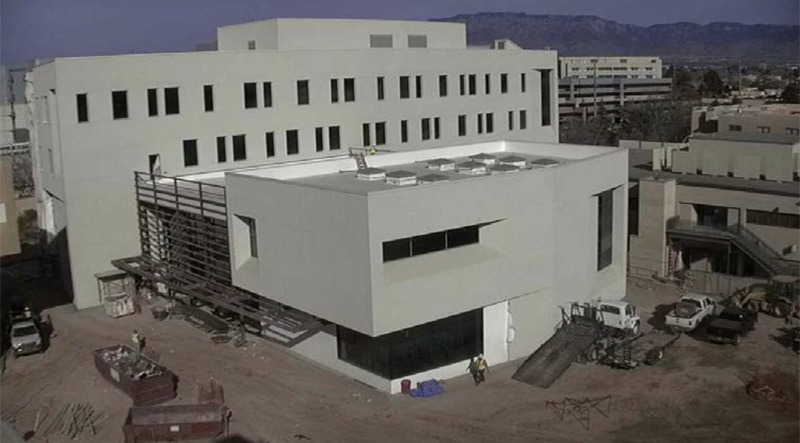 The first floor in building "A" (4 stories) has 99% of the MEP complete. MEP = Mechanical, Electrical, & Plumbing. The same crews work each of the floors from 1st through 4th. This week building "B" (2 stories) will receive insulation board, vapor barrier, wire, and a scratch stucco coat. The new elevator for ASM (formerly known as ASM East) is now scheduled to be operational March 2018. Many thanks to Dr. Gautam Vora for his work in moving out of his old office and into a new one. His office will become the second floor elevator lobby. In addition, thank you to our advising staff for helping by vacating an office for the ground floor elevator lobby. Documentation courtesy of Dr. Steven Yourstone. The project is on schedule for an expected completion by the end of March 2018. The first photo below shows level three before the concrete pour. 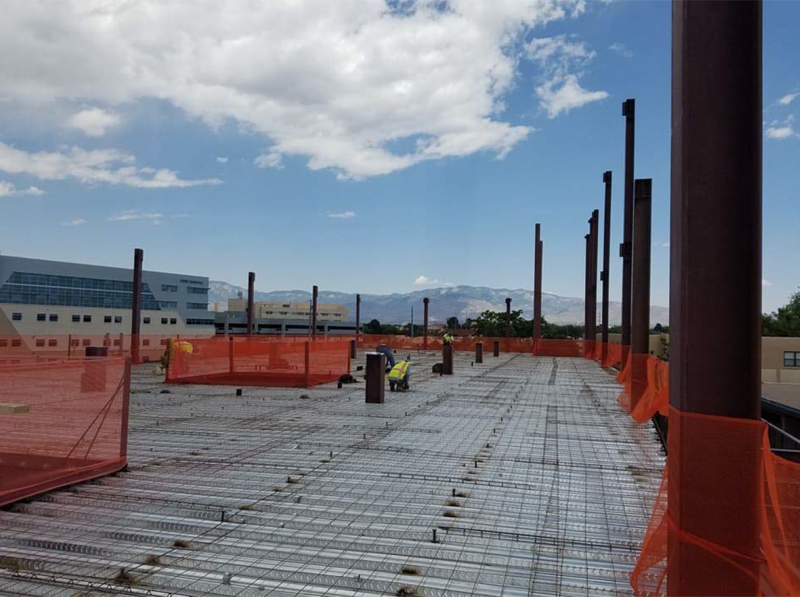 Prior to a concrete pour for a higher floor the steel beams are covered with metal decking, wire mesh, and large bolts. The second photo shows the state of the work on the south portion of the new building as of June 29th. This portion will house four classrooms. The project is just one day behind schedule. This is due to longer than expected time to place and attach the second floor metal decking. Once that is completed then concrete is poured to form the second floor surface. A new elevator for ASM East is in the design and planning stages. The elevator will be installed immediately to the left of the west doors. You can locate that position in the photo below. The elevator will open into the envelope of the building. In order for the installation to take place, we have been working with Dr. Vora to assist him in his move to a new office in ASM. Dr. Vora has been very gracious in allowing our contractor to enter his office for testing of the walls and flooring for asbestos. If any asbestos is found then the space will be remediated. 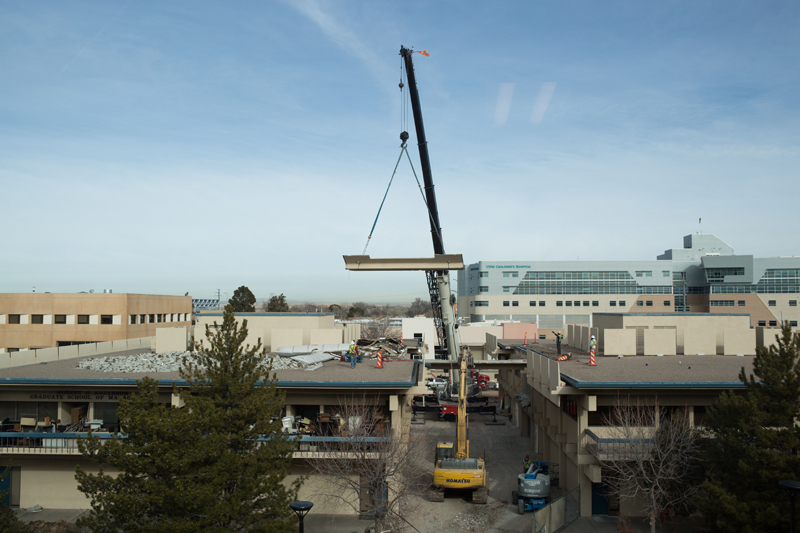 The new elevator will take Dr Vora’s office as well as an advising office directly below. At this time, the elevator project is expected to begin on or around August 1st and complete on or around the end of January 2018. 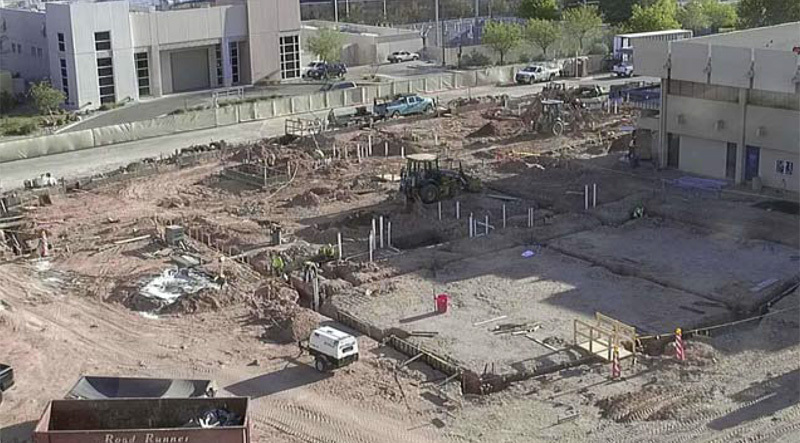 The East/West bar (building "A") will be a four story structure. The North/South bar (building "B") will be a two story structure. They join together at our new living room. The living room will have a two story high ceiling. The first beam of the MCM has been placed in the far northeast corner. The project is now on schedule. Monday, May 8th the structural steel and a crane will arrive. McCarthy Brothers has FAA approval and will inform the hospital’s medical helicopter operations. 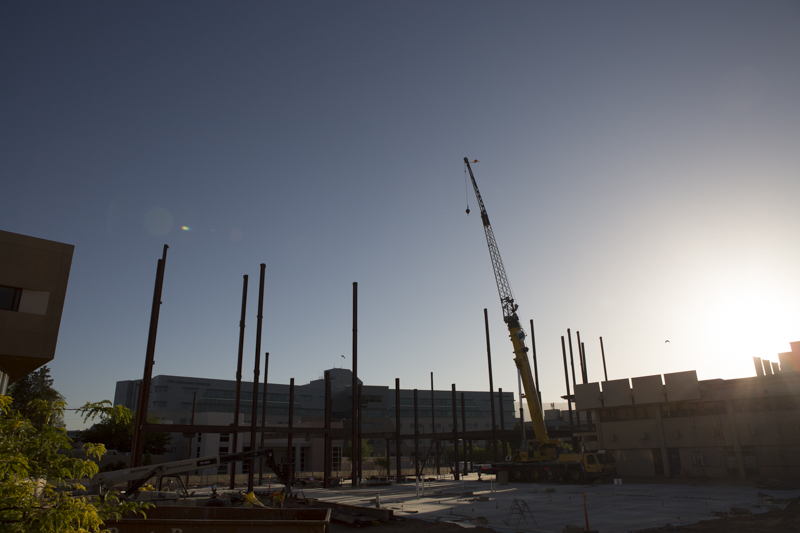 The structure will emerge from the ground at a faster pace with more immediate and visible results. 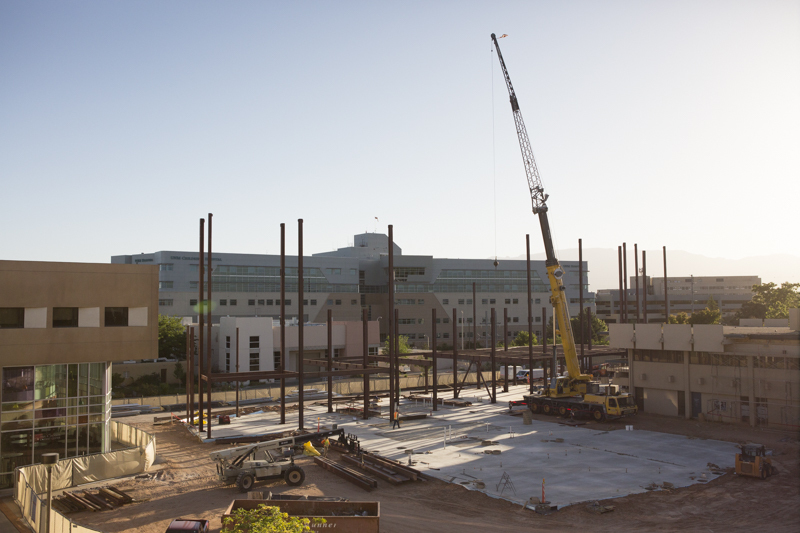 The steel erection crane will be positioned adjacent to the west side of Anderson. 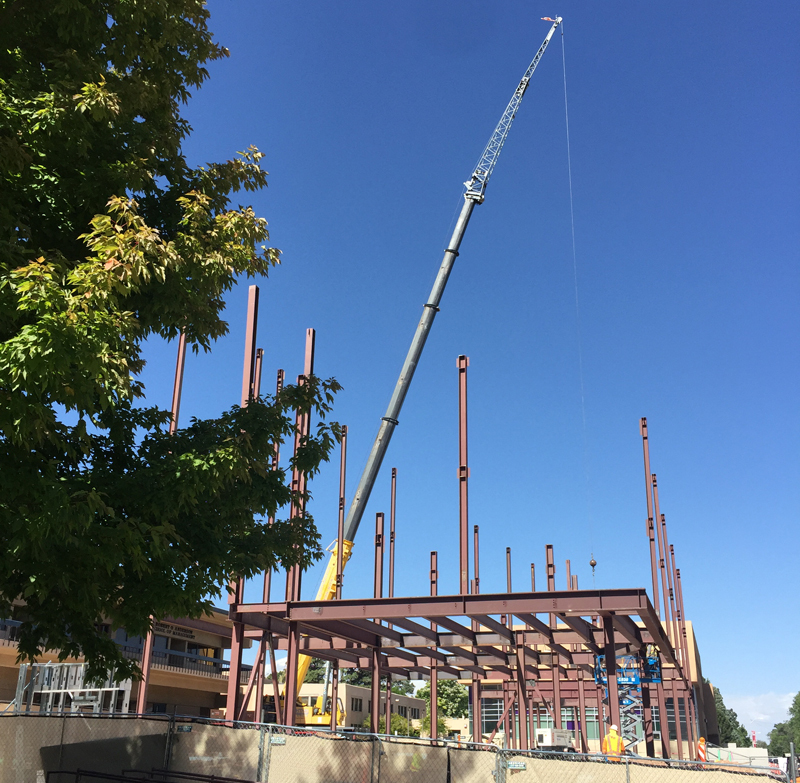 The crane will be able to hoist steel to all parts of the building without a repositioning. Finally, a new handrail has been installed along the concrete steps at the South West corner of Anderson. In a previous memo, it was stated that those steps would be closed off. The steps can now remain open. Initially it did not look like a handrail would work in that space. The project is approximately 12 hours behind schedule due to the heavy rains that we received on Tuesday, April 25th. 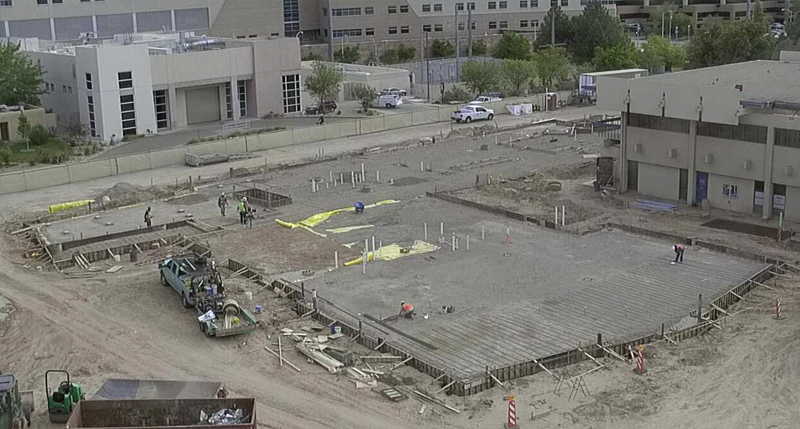 McCarthy Brothers, Chavez Concrete, Miller Bonded, and DKD Electric are moving forward with the expectation of a large concrete pour for the building deck on Monday, May 1 or Tuesday, May 2. In the following photo, you can see the outline of the building defined by the wood grade beam frames. Yellow vapor barrier covers the dirt. A layer of aggregate is smoothed and compacted over the vapor barrier. You can also see rebar being laid in and tied together. This will form the building slab. 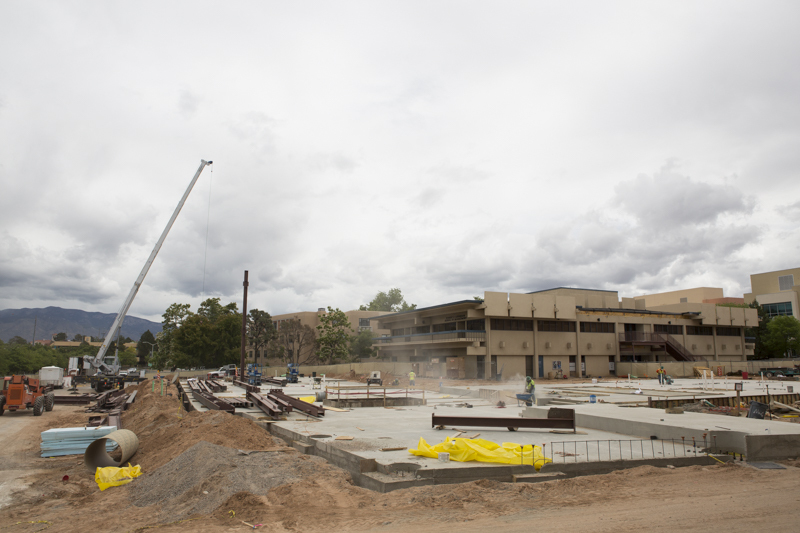 The foundation of this building, unlike many older buildings on this campus, is a system comprised of 93 auger cast piers and the grade beams. The grade beams are built into trenches with rebar and concrete. The grade beams and the piers have been tied together. Therefore, the weight of the building does not sit on the building slab nor on the dirt below. The piers and grade beams form the support for the structure above. This makes it much stronger and able to withstand earth movement and wind load. 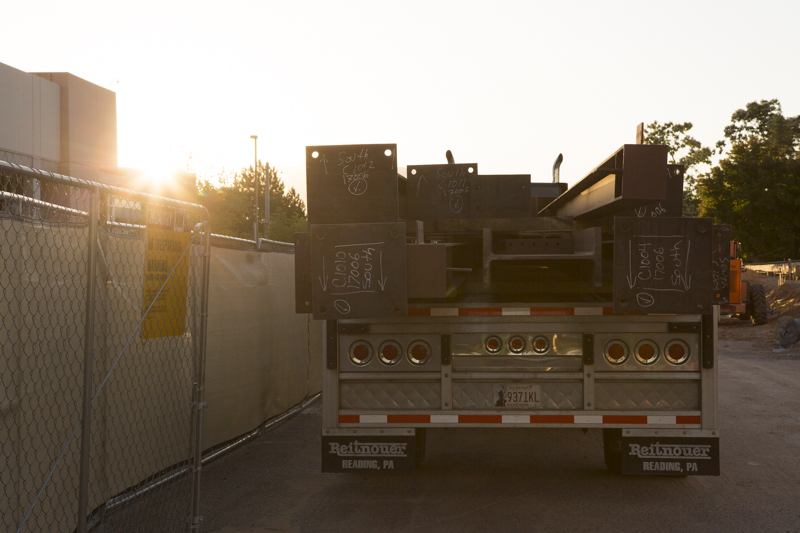 Monday, May 8th, is the scheduled delivery day for the first shipments of structural steel. 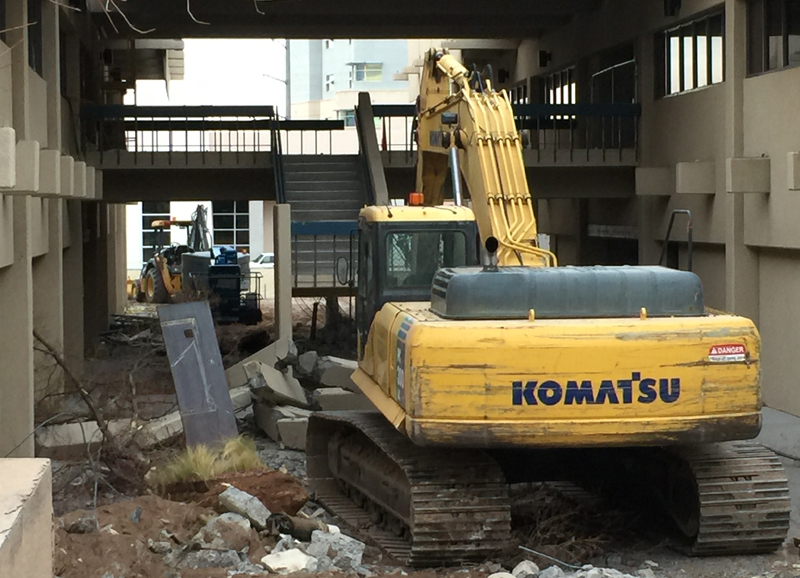 The concrete stairs at the southwest corner of ASM East will be blocked off for safety reasons. It will stay that way until late in the project. There is no handrail which poses a safety issue. There is no effective way to add a handrail to that area. There will be a power outage on Monday May 15th for the better part of the day. 1) ASM: NO power, NO internet, NO fire alarm system, NO airflow. 3) Hokona: Power ON but NO hardwired internet. WiFi will be ON. This power outage is necessary to set up temporary power for the building trades to work on the new structure. There is also a switch that needs work in the basement of Economics. That is separate from the building project. Instead of two outages there will be just one. Choose to work elsewhere if you are in ASM East. There will be no power, no internet, no lights, and no airflow. Dr. Yourstone will be the official fire watch that day patrolling all of ASM all day. 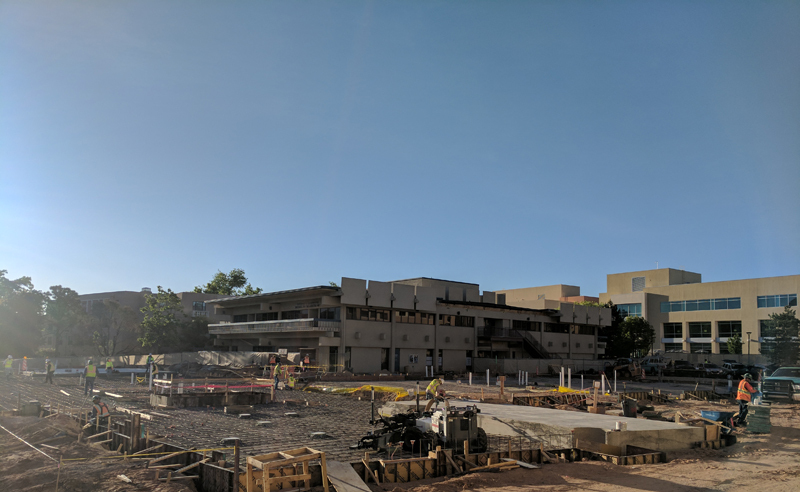 The photo below shows the state of the construction as of Monday, April 10, 2017. You can see trenches and piping. The trenches have been lined with rebar that connects with the tops of most of the auger cast piers. Concrete will then be poured. 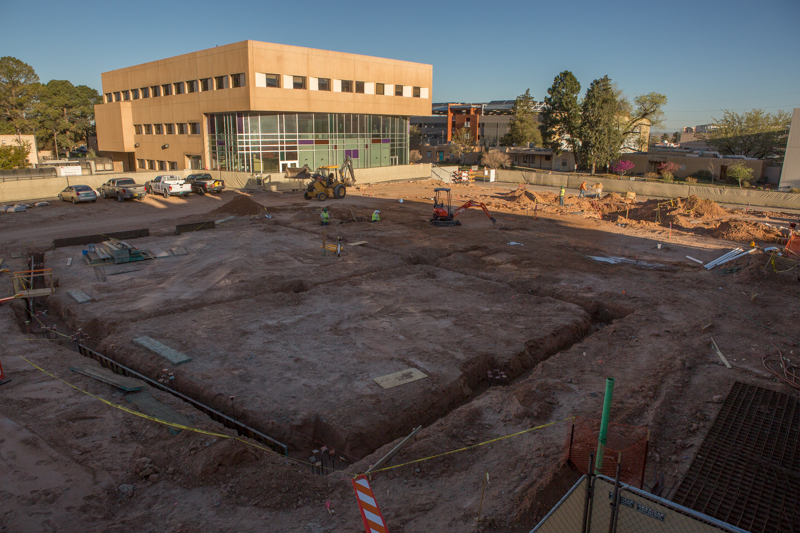 A great deal of underground piping, underground electrical pathways, and a mechanical vault have been installed. Photos and documentation courtesy of Dr. Steven Yourstone. Auger cast piers are completed. Now you will see trenches created to build grade beams, which will connect adjacent piers. This will be the support system for the new building. 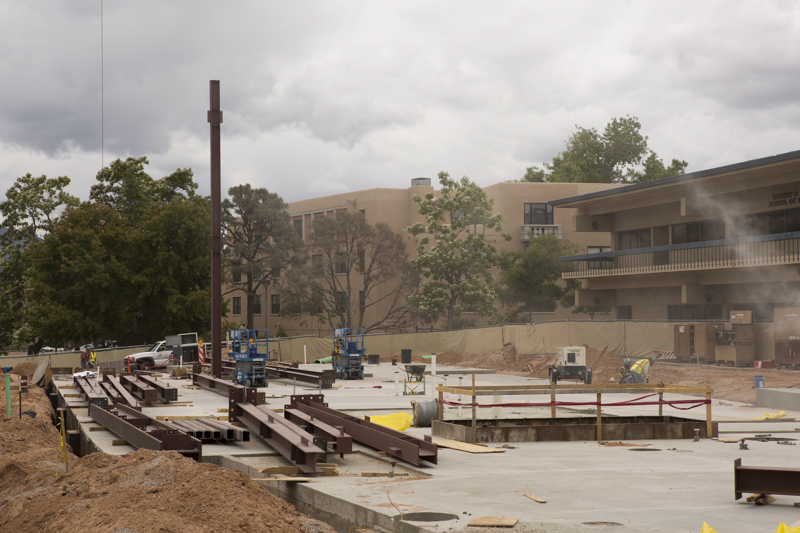 The grade beams are rebar and concrete. This portion of the project is expected to be completed on or before March 31, 2017. 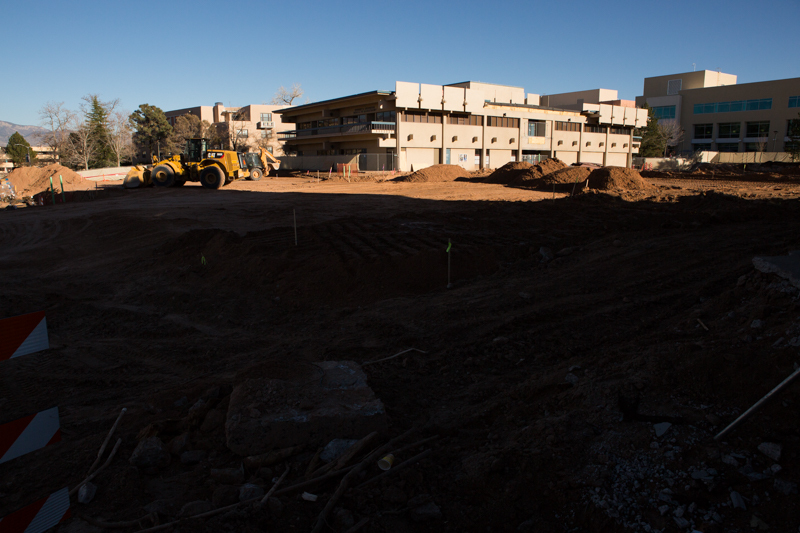 In the following photo, you can see the south end of the new building footprint on the right side. Auger cast piers are being drilled. 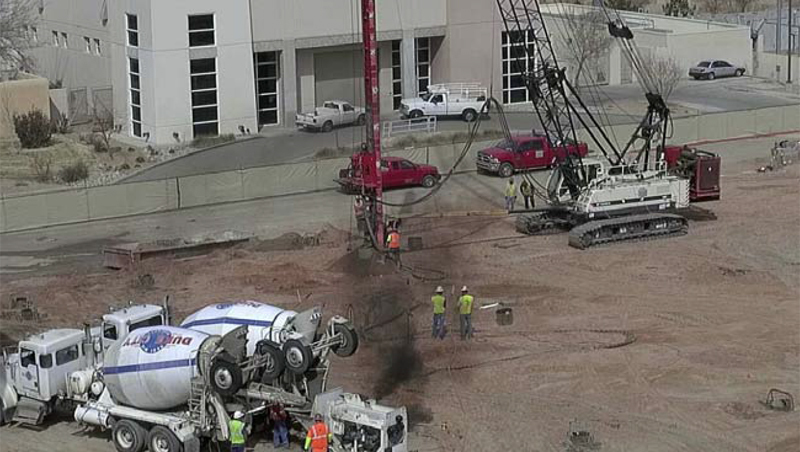 As the drill descends, concrete is pumped in to fill voids. A rebar cage is lowered into the hole and set in place. This portion of our project is expected to be completed by March 14, 2017. The demolition completion date is 2/10/17. Most of the ASM West structure is down. 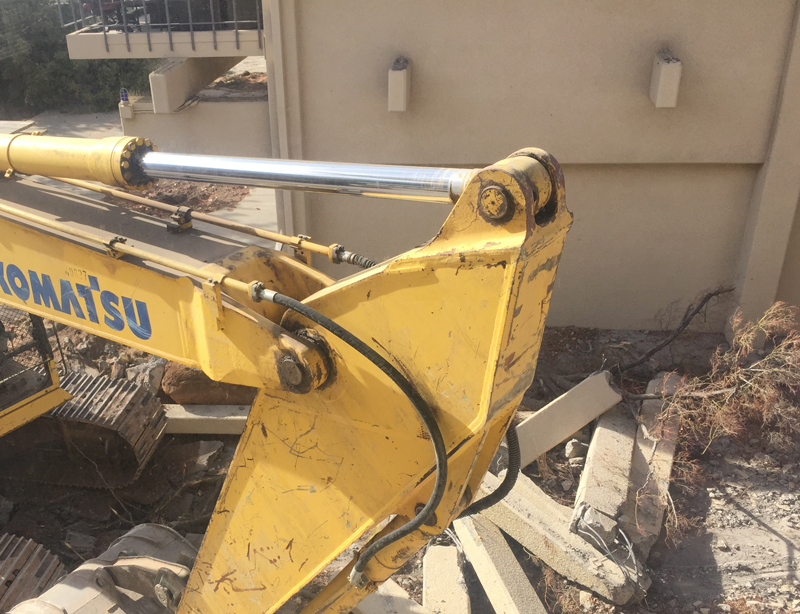 C&C Demolition Services workers are removing the deep foundation and the spread footers. 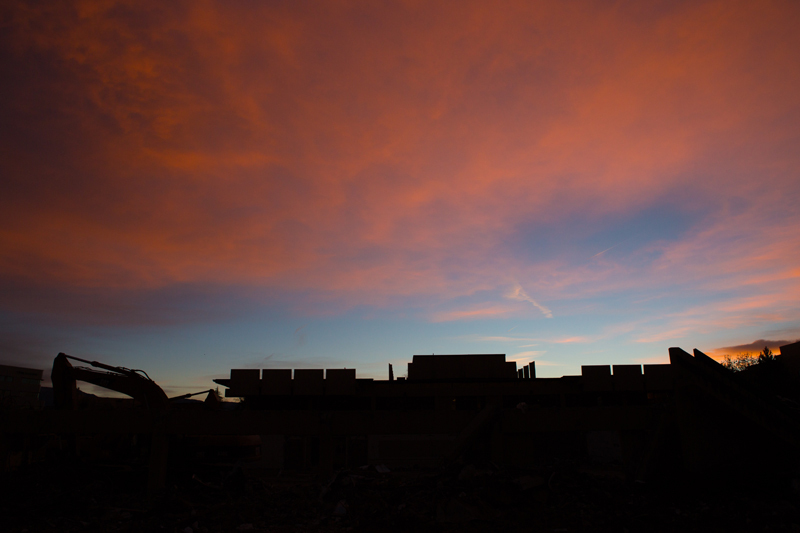 Only the ground floor structure remains. The expected time at which the above ground structure will be gone is on or before Friday, February 3, 2017. 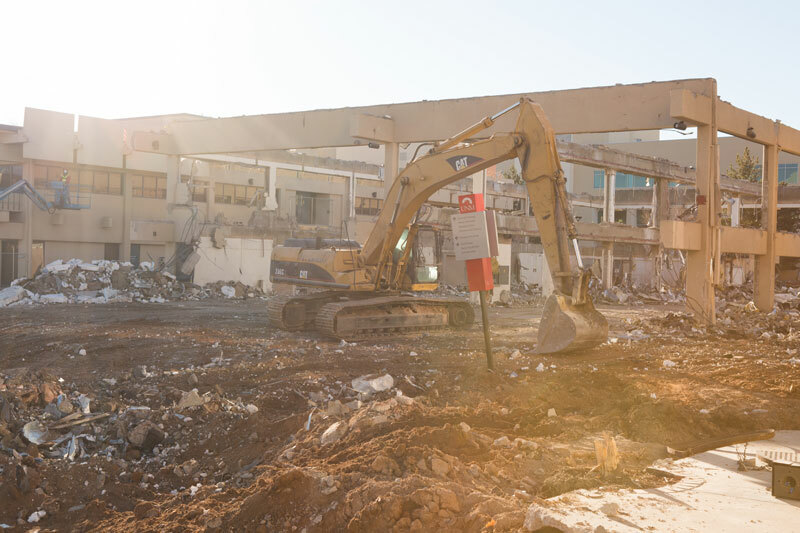 C&C Services has been extremely careful in this demolition process. 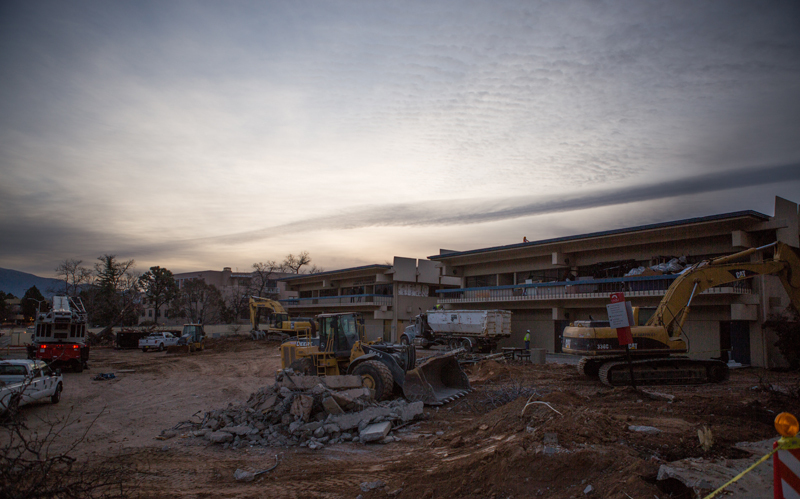 Following Friday, the foundation of the West building will be removed. Then DKD electric will work to encase the primary power pathway running to ASM East. Currently that pathway runs through the West foundation. It seems hard to call it a building now. May good memories of that building. 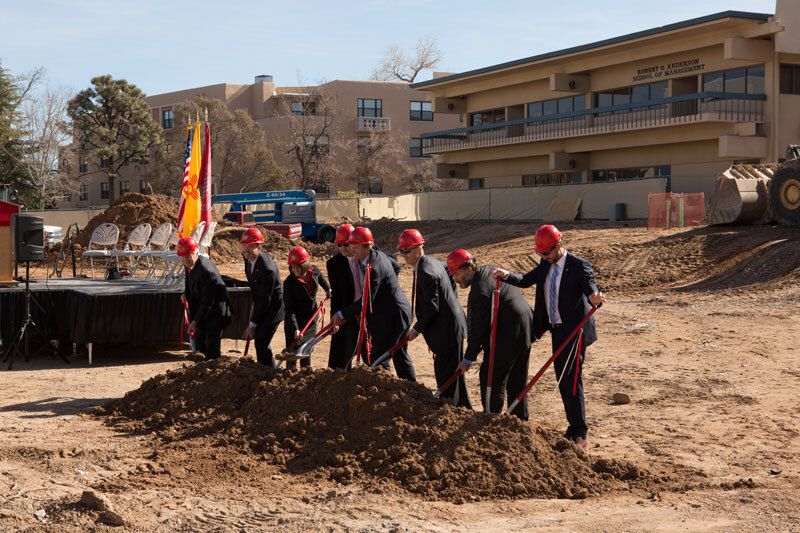 The groundbreaking ceremony scheduled for Monday, January 30, 2017 at 11 a.m. will be held inside of the construction fence along Las Lomas. Following the ceremony there will be refreshments in Jackson Student Center. 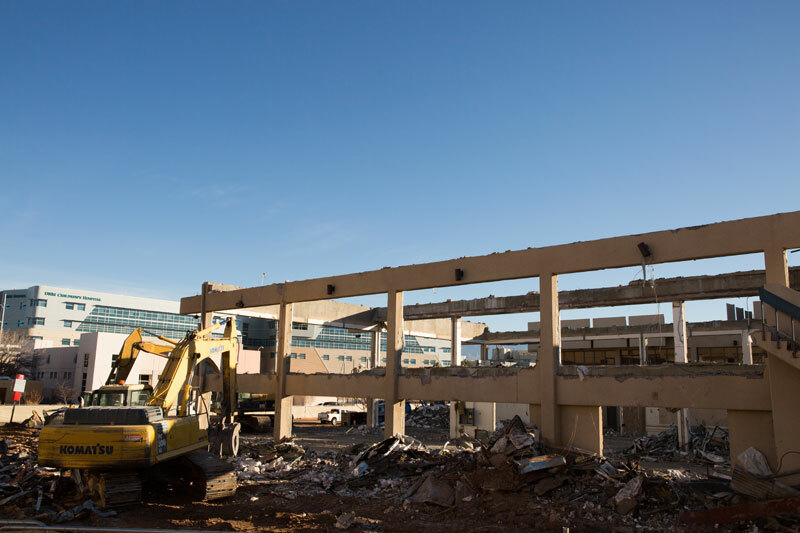 The demolition completion date is February 10, 2017. After the structure is down then work begins on removing the deep foundation and rerouting the primary power pathway to ASM East. In the following photo, you can see the remaining lettering on the south beam of ASM West. Many requests have come in to retrieve and save those letters. That said, tomorrow our contractor will place a worker in a lift bucket at the letters to cut them away. We have not yet determined a reasonable way to use the salvaged letters. 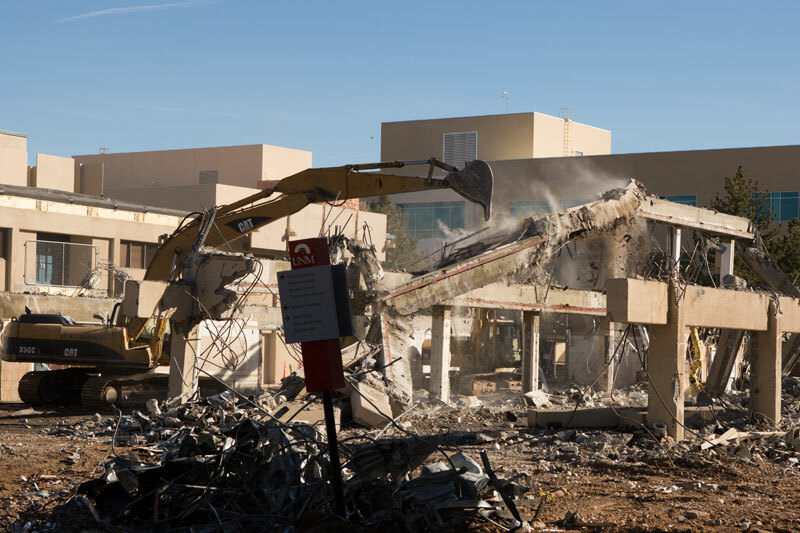 The demolition will get noisier as of tomorrow morning (Friday, January 20, 2017). The vibrations will increase as well. The contractor is bringing in another piece of equipment equipped with a ram. 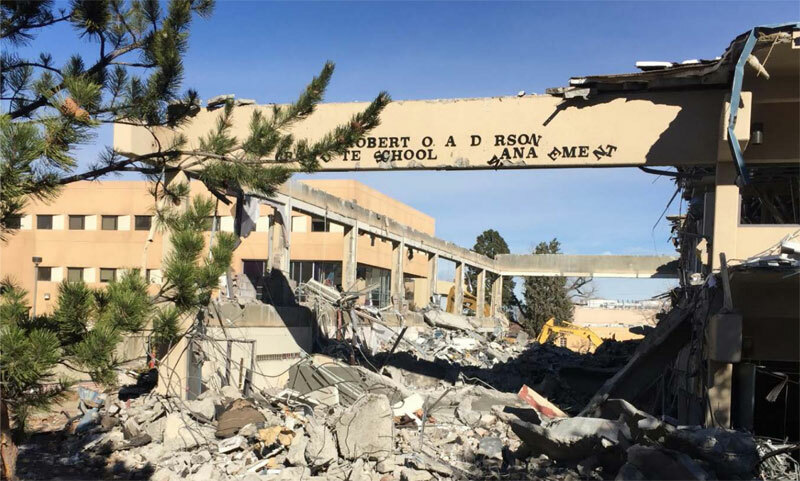 The ram will repeatedly strike the West building structure until the structure gives in. That will be noisy. There is also dust. You are advised to not linger around outside and breathe in the dust. Photo courtesy of Trish Ransom. Documentation courtesy of Dr. Steven Yourstone. Progress on the envelope demolition for ASM West is coming along. 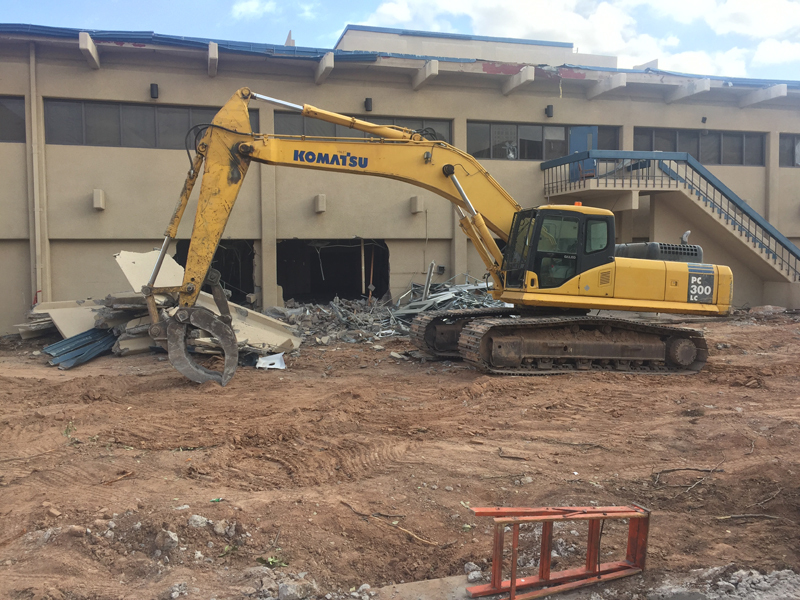 The demolition contractor will pull out as much metal, wood, and other materials as possible before the concrete is taken down. Recycling of materials will then take place. The newly opened ADA access ramp is located between ASM East and Hokona. Kudos to our fantastic McCarthy Brothers crew for getting this open early on the first day of classes. Photo courtesy of Steve Carr. Documentation courtesy of Dr. Steven Yourstone. All hazardous materials including asbestos have been safely removed. ASM West passed an independent test for any remaining asbestos. No significant levels were detected. 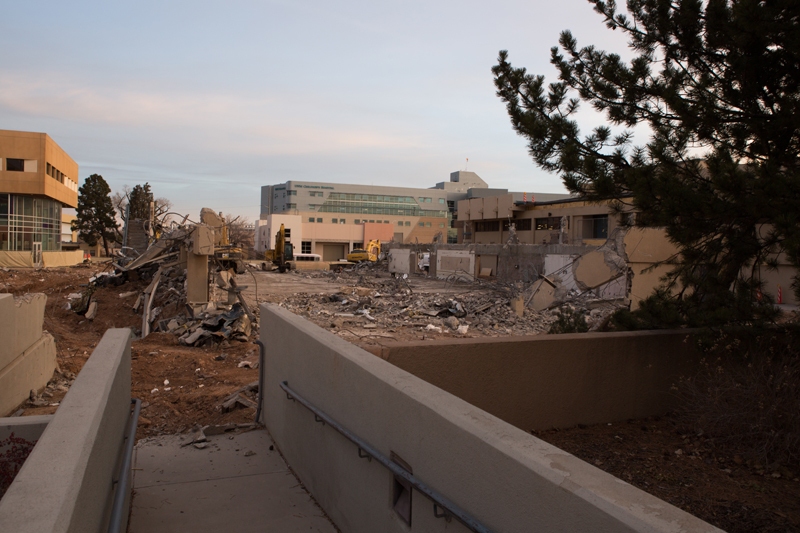 The demolition company is removing as much of the interior materials as possible. They will separate the materials and recycle. 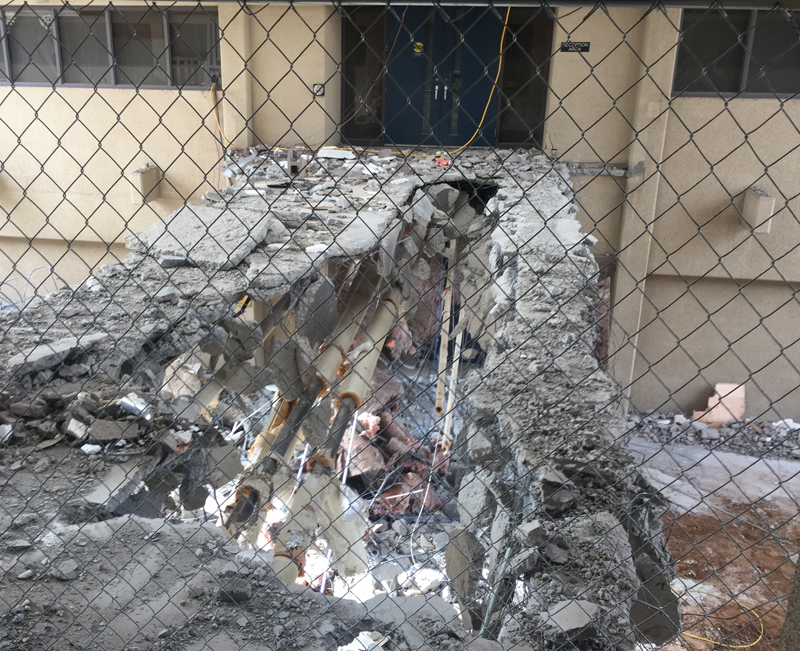 The walkway in the breezeway on the second floor is no more. The crane might arrive tomorrow to hoist the roof canopy off. Significant progress by McCarthy Brothers has been made in the past 24 hours. The breezeway has a few holes in it and no stairs. 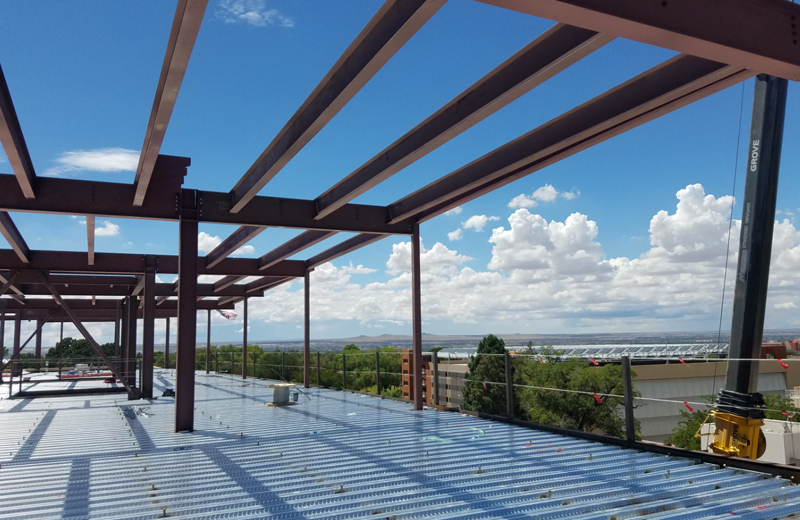 McCarthy construction superintendent Devin McDonald yesterday described the challenges in safely bringing down the roof canopy connecting ASM West and East. The canopy beams are integrated into the roof structure of both buildings. In order to remove the canopy, it will be necessary to open up the roof on the West side of the East building. If I recall correctly Devin told me that he estimated that the roof canopy weighs in excess of 100,000 pounds. I may be off on that weight. Nevertheless, it is very heavy and caution is an imperative. A crane will be used to lower it in one piece.